John Brown Jr. receives the Congressional Gold Medal from President George W. Bush at a ceremony in the Capitol rotunda on July 26, 2001. John Brown Jr., 88, a Navajo Code Talker and former tribal counciman, died Wednesday morning at his home in Crystal, N.M., according to the president's office. President Joe Shirley Jr. conveyed his condolences to the family. "Today, with sadness, we heard of the passing of Mr. John Brown, Jr., one of the original 29 Navajo Code Talkers and one of the Navajo Nation's great warriors," Shirley said. "For so long, these brave men were the true unsung heroes of World War II, shielding their valiant accomplishments not only from the world but from their own families. "The recognition and acknowledgment of their great feats came to them late in life but, for most, not too late," Shirley said. "These heroes among us are now a very precious few, and we, as a nation, mourn their loss. We offer our deepest condolences to the family of Mr. John Brown, Jr."
Shirley ordered flags on the Navajo Nation to be flown at half-staff beginning May 21 in Brown's honor and until after the funeral. Funeral arrangements are pending and will be announced. A community meeting is scheduled for 6:30 p.m. today at the Crystal Chapter House. Brown was born on Dec. 24, 1921, in Chinle near Canyon De Chelly. His mother was the late Nonabah Begay, who passed away at age 102 two years ago. His father was the late John Brown. Brown went to school at Chinle Boarding School, and graduated from the Albuquerque Indian School in 1940. "From there, he remembered Pearl Harbor," said his son, Frank Brown. "He was playing basketball and heard about the bombing. Sometime after that, he remembered a number of Marine recruiters started talking to the young Navajo boys. He ended up going to Fort Wingate, N.M., to the military installation there." Frank Brown said his father recalled being signed up, sworn in and given his physical right then and there. "They sent him immediately to Camp Pendleton for basic training," he said. "They weren't allowed to go home to say goodbye to their family or write letters. "At some phase in their basic training, they were taken into one big room and a commandant told them they were all there for a special reason, and they were to devise a code in their language," Frank Brown said. "The boys were left there in the room and they didn't know what the heck to do," he said. "But they devised the code using names of animals and mammals to describe what would go with the alphabet." The initial code consisted of translations for 211 English words, which was expanded to 411 words, most frequently used in military conversations. Included in the list were terms for officers, airplanes and months and an extensive general vocabulary. Also included were Navajo equivalents for the English alphabet so that the code talkers could spell out names or specific places. From 1942 until 1945, Navajo Code Talkers participated in numerous battles in the Pacific, including Guadalcanal, Iwo Jima, Peleliu, and Tarawa. They not only worked in communications but also as regular soldiers. Frank Brown said his father served in four major battles at Tarawa, Saipan, Tinian and Guadalcanal. 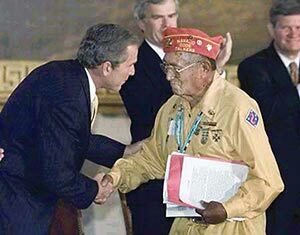 On July 26, 2001, John Brown Jr. was one of the original 29 code talkers presented with the Congressional Gold Medal by President George W. Bush. That recognition came 56 years following World War II. The code, based on the Navajo language, was de-classified in 1968. "It is, indeed, an honor to be here today before you, representing my fellow distinguished Navajo code talkers," Brown said at the presentation at the U.S. Capitol Rotunda in Washington, D.C.
"Only destiny has demanded my presence here, for we must never forget that these such events are made possible only by the ultimate sacrifice of thousands of American men and women who, I am certain, are watching us now," he said. "And yes, it is fitting, too, here in the Capitol Rotunda - such a historic place, where so many heroes have been honored - I'm proud that the Navajo Code Talkers today join the ranks of these great Americans. "I'd like especially to thank Senator Bingaman and all of work that he has given to make this occasion possible, to recognize the code talkers. "I enlisted in the Marine Corps in 1942, not to become a code talker - that came later - but to defend the United States of America in the war against the Japanese emperor," he said. "My mother was afraid for my safety, so my grandfather told her to take one of my shoes, place an arrowhead in it, take it to the mountain called Two Little Hills, and go there every day to pray that I would remain safe. "Maybe she was more successful than she imagined because the Marine Corps soon had the Navajo Marines develop a secret code using our language. My comrade and I volunteered to become Navajo radio operators, or code talkers. "Our precious and sacred Navajo language was bestowed upon us, not a nation, but a holy people," he said. "Our language is older than the constitution of the United States. I'm proud that, at this point in American history, our native language and the code will developed came to the aid of our country, saving American lives and helping the other U.S. armed forces ultimately to defeat the enemies. "After the original 29 code talkers, there are just five of us that live today: Chester Nez, Lloyd Oliver, Allen Dale June, Joe Palmer and myself. "We have seen much in our lives. We have experienced war and peace. We know the value of freedom and Democracy that this great nation embodies. But our experience has also shown us how fragile these things can be and how we must stay ever vigilant to protect them, as code talkers, as Marines. "We did our part to protect these values. It is my hope that our young people will carry on this honorable tradition as long as the grass shall grow and water shall flow. Maybe Japan is listening. "Mr. President, we four original code talkers present this day, including the families of my comrades who aren't able to be here with us, are honored to be here to receive this award. Thank you," he concluded. In November 2002, more than 200 of the subsequent code talkers received the Congressional Silver Medal at Window Rock. In 1971, President Richard Nixon awarded Navajo Code Talkers a special certificate in thanks for their patriotism, resourcefulness, and courage. They were included in the July 4, 1976, Bicentennial Parade in Washington, D.C. In May of 1982, the U. S. Senate passed a bill declaring Aug. 14 National Code Talkers Day. Frank Brown said his father lived a hard life, first training as a welder, then becoming a journeyman and master carpenter and cabinetmaker. He entered politics in 1962 as a member of the Navajo Tribal Council and served until 1982. Afterward, he served three terms as Crystal Chapter president. "He was always active in politics," Frank Brown said. "He was a wonderful speaker." After politics, he began a second career as a traditional counselor for the Navajo Nation's Division of Social Services, driving 130 miles round trip to Chinle each day to work. After that, he went on a lecture tour speaking about the Navajo Code Talkers around the country and becoming active in the Navajo Code Talkers Association, Frank Brown said. "Dad was also a traditional practitioner," he said, "constantly learning the traditional way of life but at the same time he was always active in the Mormon Church." John Brown Jr. is survived by his wife Loncie Polacca Brown and his children Dorothy Whilden, Preston Brown, Everett Brown, Virgil Brown and Frank Brown. His other children were the late Dale Brown and the late Ruth Ann McComb.